Amazing news! 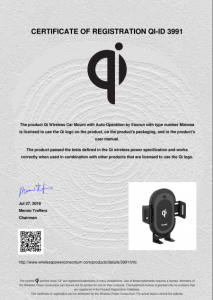 Our invention patented wireless smart car mount Mimosa has been Qi certified. Till now, this is the second wireless charger that have been Qi approved by WPC and the Qi certificate were received within the same month! To know more, contact us today! Awesome! Esorun Joined WPC as Qi Member! Qi Certified for Suction Power Bank!! !